Death is the loneliest state of existence, a fact that Boston Brand never stopped to consider...at least not until he died. 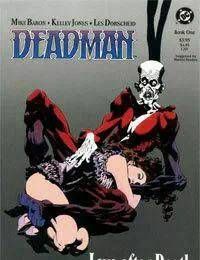 But after an assassins bullet cuts down the famed circus aerialist, Deadman learns the hard way what its like to be truly alone and all he can do is pray that he would one day find love after death. Investigating an abandoned circus in the Wisconsin Northwoods, Deadman comes upon another ghost...the spirit of a female aerialist who was rumored to have been murdered by her husband, the owner of the circus. The two spirits fall in love...but even death cant protect her from her still-living husbands jealousy as he unleashes a horde of side show horrors to keep them apart. But thats only the tip of the supernatural iceberg and something even more sinister is under way.